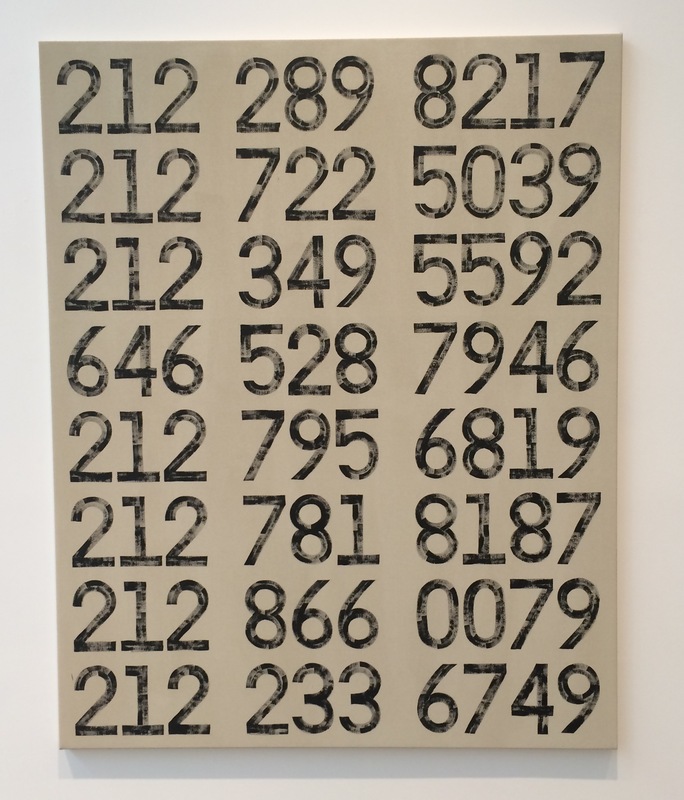 The exhibition “It’s Been Too Long” at the UNTITLED Gallery on Orchard Street features a recent (2015) series of paintings based on telephone numbers. Wagner has randomly selected telephone numbers from the NYC and LA white pages. He paints columns of the enlarged numbers. The numbers have been painted with uneven brush strokes so that the resulting numerals look as if they have been stamped with an old fashioned rubber stamp and ink pad onto the parchment-colored background. These paintings are an exploration into society’s association with numbers. The rows and columns of numerals become abstract geometric patterns. Removed from the initial source they lose their meaning and purpose. The whole concept of a paper telephone directory is becoming obsolete. In this digital age the once important pages are becoming visual artifacts. The gallery installation fills an entire room with these canvases, creating an environment of numerals. As some one who likes to work with numbers, I found it quite soothing, almost meditative. It makes me think of all of the other places we see numbers: train cars, mileage signs along the road, credit card numbers, etc… and never stop to think about the aesthetics. Numbers are an important part of our lives but quite often we tend to only use them for practical applications, never stopping to appreciate their visual qualities.